Defunding the Arts is Part of a Conservative Strategy Against Liberals - Fact or Myth? "Defunding the arts" is part of an ongoing coordinated strategy against progressives and liberals. The idea is that since FDR (and even Wilson) America has headed in a progressive direction, and at the helm of that movement has often, but always, been the Democratic Party (well the liberal and progressive Democrats like Kennedy, Obama, and Bernie at least). Here I could note that the Democrats used to be the Party of slavery (not exactly a progressive position), but that talking point would only act to sidetrack us from the topic… the topic here being the increasing progressiveness of the Democratic party in the 20th and 21st century and the pushback against it by the Conservative Coalition (at times in both parties, today mostly just in the Republican party). The charge of that Conservative Coalition, from a Powell memo perspective, is that “the liberal elite” (neoliberals, talking heads on PBS, university professors, Hollywood, etc) push a progressive (AKA socialist and Marxist) message to the masses using government funding. For example, the funding of “biased liberal media” like PBS using state dollars. The concept is thus, if they can stop PBS, they can stop the left from spreading its message on the tax payer dime. That is sound logic on some level (to the extent that those groups of people do tend to be more liberal), but on another level, the result is a war on education and the arts (where here we are talking about the arts specifically, but the attack on teachers and universities is a subject not far removed). I’m not making this up, just read: Trump is right to cut PBS/NPR funding. It’s just elitist propaganda anyway. Interest Groups: Crash Course Government and Politics #42. PBS explains political factions in a centered way (which apparently isn’t good enough for the Newts of the world). So, is there some logic here? Again, yes. The logic is that free-enterprise folk of the Conservative Coalition tend to work in business, and liberal and progressive folk tend to go into education, the arts, and science. Thus, each side comes to life, the workplace, and government with a natural bias. The activist right charges that hippies are pushing an anti-market message that is bad for America, so they want to John Birch Society us back to 1900 (before all that feminism and civil rights “Big Government”, and all that New Deal and Great Society “Big Government”, and even all that New Freedom “Big Government”). The activist left charges that businesses are pushing an anti-intellectual, environmental, science, arts, etc message, so they want to PC us forward into a liberal utopia. Half joking here to keep things light, but hopefully you do get the serious point I’m making. The reality is, the activist conservative movement doesn’t just want to cut education, the arts, and science. They want to cut those things, to undercut the left, in order to more easily go after things like the social safety net programs… and they want to replace those messages with “traditional American values” and “nationalism” and other right-wing-y sounding John Birch things. That is what all right-wing media from PragerU to think tanks like Heritage are about, that is what the law maker ALEC is about, and most of those who fund the GOP are about it too (now more than ever since Citizens United and the repeal of the Fairness Doctrine, which are both part of this same sixth party strategy; you don’t have to trust me, just follow the money). Its all a coordinated strategy of right-wing oligarchs (those who come to power through wealth) based on their ideology. … And that means corporations get tax breaks and education, arts, science, and every social program that isn’t subject to mandatory spending gets cuts. It is a vast right-wing conspiracy in the same way that funding education, arts, science, and every social program with tax increases is a vast left-wing conspiracy. That is, each side is pretty clear about their intentions. 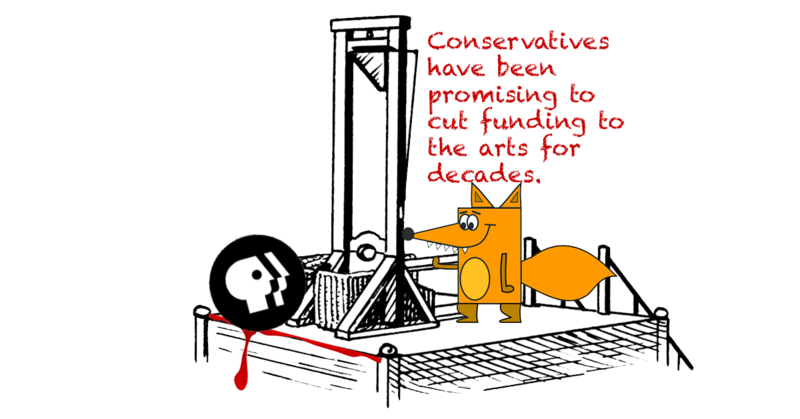 And on the right, the intention is to cut funding for the arts. Of course the Arts aren’t the only thing on the list, as noted, science is on the list, liberal Hollywood is on the list, feminism, LGBT, liberal education, all of it. And of course, one day, if the left takes control of the Presidency, Congress, Courts, etc… you can expect right-wing things on the chopping block. Which is, you know, part of the point the Powell memo was trying to make. Really, life isn’t simple, but to my overarching point, there is a Conservative Coalition, it does want America First, and it is sure as it wants to build a wall trying to defund the arts. FACT: Conservatives have been promising to cut funding for decades. Newt Gingrich and the Republican Revolution of 1994 wanted to cut federal funding for PBS and NPR, but failed. When the Tea Party took over the House in 2010, they likewise failed to pass the promised cuts. This time, conservatives control both houses of Congress. Learn more at Breitbart. This has nothing to do with Trump’s America First budget, it is known and well documented right-wing strategy against liberals that Trump is participating in. TIP: The following video is meant for impact. It is an example of what sort of progressivism has become the boogyman of the right, and it is also calling out the usage of the term “America First” (which is a term used by a group of Americans who supported fascists; look it up, its not unrelated). The Hidden Secrets of the ‘America First’ Movement. Conservatives are scared of people like Thom Hartmann, so they do what Thom Hartmann accuses them of (which is being quasi-fascists and using dog whistles). I strongly feel the answer is in the center, but when in Rome, right? FACT: President Donald Trump’s very first budget was nothing but an attack on liberals. That is not an opinion, that is a fact. Page 11 of the “America First” budget ends federal funding to the Corporation for Public Broadcasting (CPB) — which, in turn, supports National Public Radio (NPR) and Public Broadcasting Service (PBS).CPB’s annual federal funding of roughly $445 million — a minuscule fraction of the federal budget — is one of the items reportedly on the chopping block. The U.S. government collected $2.99T in tax revenues and spent a total of $3.54T in its 2016 budget, resulting in a deficit of $552B that year. The total net-worth of America is about 100 times our budget with our 2014 assets at least $269.6 trillion. This isn’t’ a budget item, it is an attack on our American values from the far-right. SAD! The Brainwashing of My Dad Trailer. This documentary explains that strategy. Defunding the arts is an attack on liberals, I could have said it nicer above, and I’ll probably end up revising it… but the thing is, I purposefully used wordplay while offering facts to show just how awful it can be when we try to destroy our brothers and sisters. What sort of mad tyrant seeks to destroy liberalism and progressivism in the name of the free-market? It is a tyrant like the despots of WWII or Pol Pot. How about reaching across the aisle, how about reforming the system to make sure the free-market view is heard, how about teaching liberals about business. There are a thousand better ways to go about this that will be met with less resistance. If the arts are defunded, it will be the last straw for many. Calling the media “fake”, lying, and destroying the arts is despotism. No wonder they want to get rid of smart people in despotic states, this is insufferable. Right? How divisive and offensive.